BBT is an American translation agency that offers professional translation of documents with certificate of accuracy. Each certified translation of personal documentation of foreign nationals includes a certification signed by the translator and a notary attesting the accuracy of the translation and the competency of the translator to translate your document. We serve those who are pursuing immigration to the United States and applying for visas, green cards, and naturalization, students, travelers, individuals who are seeking employment in the USA. We offer professional certified translation of any personal documents for any purpose and legal translation of legal documents. 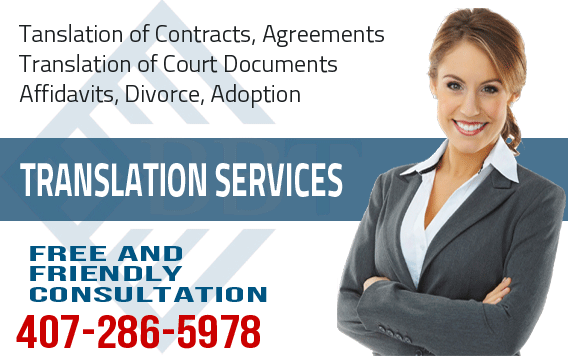 BBT Translation Services can help you by providing professional translation of documents with notarized certificate of accuracy of any documents required for immigration, employment, education and more. 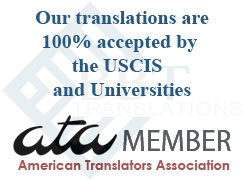 Our translations bear a raised seal on the certification. We guarantee their full acceptance by these agencies. Having extensive experience in dealing with these and other US government agencies we know exactly what type of full and formatted translation is needed. Our translations for immigration are accepted by official entities in the USA.